Welcome to the November 2013 Cloudy Nights Imaging/Sketching Contest poll! Here are the entries for November! 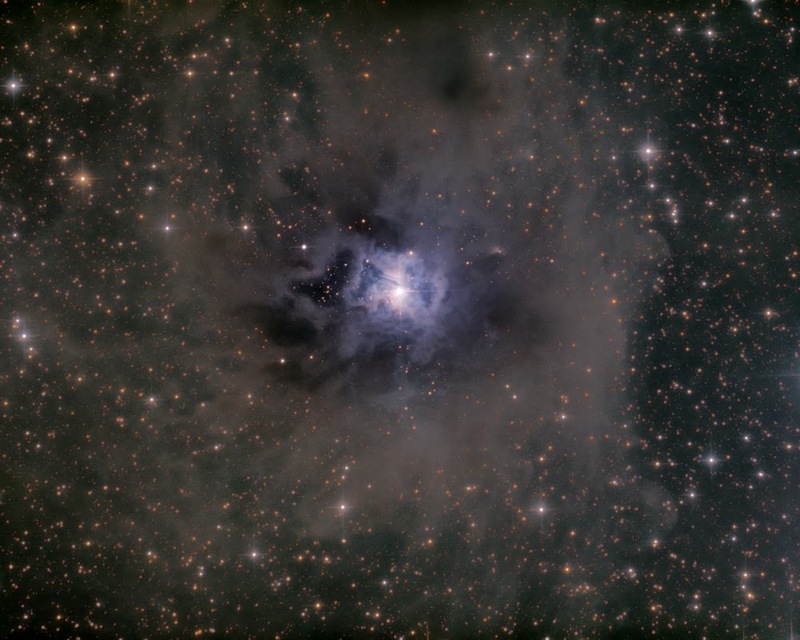 Here is my attempt at NGC 7023, The Iris Nebula! This is 13.0 hours of image data collected over 2 consecutive trips and 6 nights to my dark sky site in October and November (~6000' ASL). Imaged from the Chiricahua Mountains in Southeastern Arizona. The image was processed using a LRGB approach to the DSLR data. Because of bad weather I started to looking at old data again. I was not so happy with the old HaRGB version of this data so I did a complete reprocessing. Barnard 344 is a dark nebula in the constellation of Cygnus. It’s located close to the star Sadr in the Gamma Cygni Nebula (RA: 20h18m57.4s DEC: +40º 40' 01"). Barnard 344 is located on the bottom of the image. This region is very rich of dark and emission nebulae. On the image also VanDenBergh 130, a reflection nebula in this region, can be seen. It’s the circular cloudshape on the left center of the image. 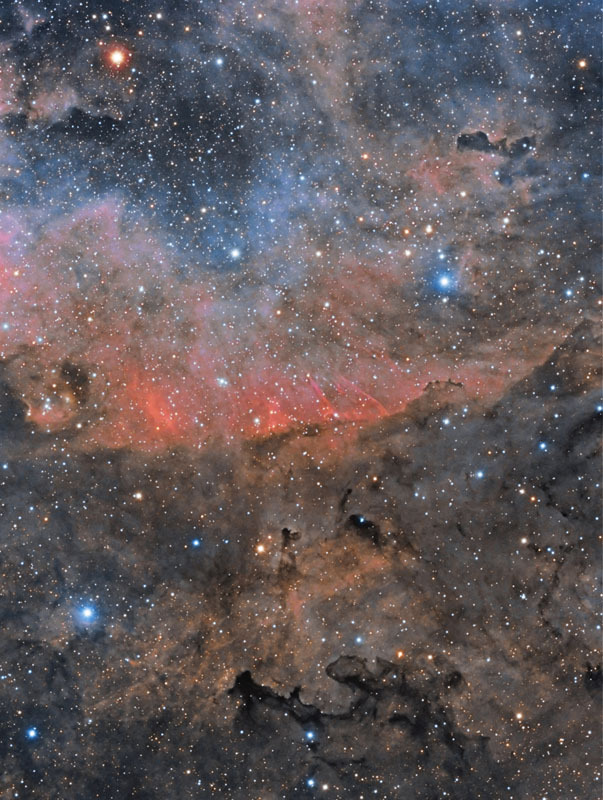 LBN234 is an emission nebula glowing with hydrogen and sulphur in the center of the image. Barnard 344 was described by Barnard himself as: “Dusky spot, 7' long; like an arrowhead, pointed SW; small star at NE end”. I observed the crater Ptolemaeus at the terminator line on October 11th through my Nexstar 5i Cassegrain at medium power magnification and through high thin clouds at times, the seeing was medium to fair, and produced this dry pastel sketch including the whole moon at near 29 inches diameter onto 100% cotton fiber black pastel paper. 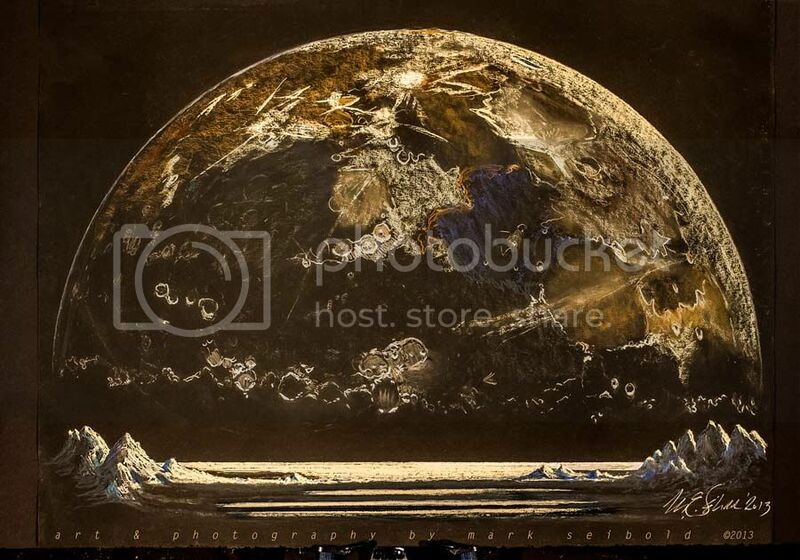 As a final touch and favorite theme, I added an artists conception as seen from the surface of the moon at Ptolemaeus. Congratulation, Mark. You represent your fellow sketch artists well. Congrats Mark - I will update the gallery and put your image on the front page shortly. I wasn't aware that the mid month voting already concluded. I am pleasantly surprised and a little shocked as I know that I have continued to hold the record for total lunar sketch wins and then also the record of the the most sketch art wins over the photographers at mid month, if I may boast that status here for those not aware of this. I feel that there are so many greater sketch artists that simply do not enter the contest and then many of those that do are equally if not better accomplished than me. It is my humble honor to also say that all of the imagers in photography here at CN are true scientific artists in their own right. The best of holiday seasons to all of you at CN! Mark, you are correct. There a some really nice sketches of all subjects as well as lunar. Often especially lunar. Folks just don't enter them. This was my first entry and it was on a whim, actually. In any case, you're obviously doing something right to hold as many wins and to be chosen as this month's winner over some really fine images in the finals and sketches in the preliminaries. So, congratulations on the magic you possess as a successful artist. It's working for you, many of us starve. .
Off the cuff, sometimes I wonder why we group images and sketches into the same contest. In the end, though, they are images, no matter the medium, of astronomical subjects. So, I guess it's fine to compete with different mediums. But just the idea of competing with a camera and image processing software has that weird feeling to it. I mean, those are some fine images I doubt any sketcher could capture as robustly. No worries, it's the way of things...it's art, I guess. In any case, you managed it. So, congratulations, again. Hold tight to your record, I have yet to get my first win but I can smell it. I think I smell it, I smell something. I hope that's the smell of victory. Kind of smell like dirty socks, maybe. I'll let you know when I figure it out. Merry Christmas, Mark, et al. I smell a fresh Christmas Tree with your future sketching gifts as winners under it. Thank you...see you around the ring, er I mean the sketching forum.